Geneva (AFP) - The Philippines came under global pressure Monday over its deadly drug war, facing calls for action following an alleged wave of extrajudicial killings. Diplomats from all continents raised concern over the surge in deaths during President Rodrigo Duterte's so-called anti-drug campaign, which has claimed thousands of lives since he took office last year. The Philippines was facing its regular review at the Geneva-based UN human rights council, where each country's record is scrutinised every four years. Canada urged Manila to "end extrajudicial killings, enforced disappearances, illegal arrests and detention, torture and harassment", with similar comments made by delegations from Australia, Brazil, France, Germany and Ghana, among many others. The United States said it was crucial for the Philippines to "investigate the allegations of the more than 7,000 deaths associated with the counter-narcotics campaign since July 2016, including over 2,600 killings by security forces and 4,000 by unknown assailants". US President Donald Trump has invited Duterte to the White House, outraging human rights groups, although the Filipino firebrand has said he may turn down the offer. The council meeting began with Filipino Senator Alan Cayetano, a Duterte ally, denouncing what he called a campaign by rights advocates and the media to distort perceptions of the government's actions. "There is no new wave of killings in the Philippines," Cayetano told the council. He said the government's enemies were using "a political tactic" of manipulating figures on extrajudicial killings to undermine the fight against a scourge that has poisoned Filipino society. He specifically highlighted the abuse of methamphetamines, linking them to violent crime and sexual violence he claims had become part of "normal life" before Duterte took office. Cayetano also showed a video clip of Duterte vowing to put "drug lords ... below (the) ground", an unusual move at the UN council where governments do not typically publicise death threats by their heads of state. 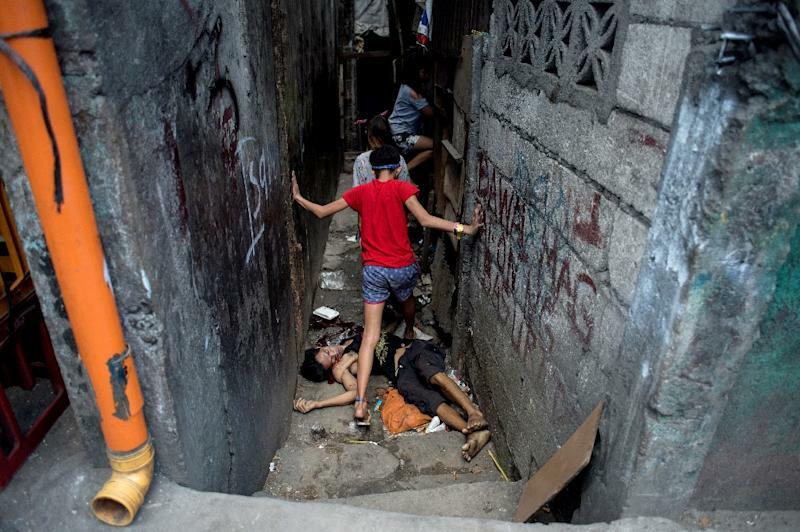 Human Rights Watch applauded the "growing chorus of international concern at the human cost of President Duterte’s murderous 'war on drugs,'" in a statement from the group's Geneva direct John Fisher. He said the UN rights body should consider expelling the Philippines, which currently holds one of 47 rotating council seats, "if killings without accountability continue." A group of roughly 50 pro-Duterte supporters braved a light rain outside the UN earlier Monday, hoisting placards proclaiming "Duterte is not a mass murderer". Foreign governments and UN officials are free to criticise the president, protest organiser, Dexi Jimenez told AFP, but added that they needed to understand "the war on drugs has gained (him) excellent ratings" in public opinion polls. Duterte was elected largely on a law-and-order platform in which he promised to eradicate illegal drugs by killing tens of thousands of people. Since then, police have reported killing 2,692 people in anti-drug operations. They say unspecified parties have murdered another 1,847 people in drug-related incidents, while 5,691 other violent deaths are under investigation. In a major report on the drug war in February, Amnesty International accused police of shooting defenceless people, paying assassins to murder addicts and stealing from those they killed. Duterte has previously boasted of taking part in killings.